Bold, roughly engraved links of yellow gold press into the face of this white gold estate wedding band. 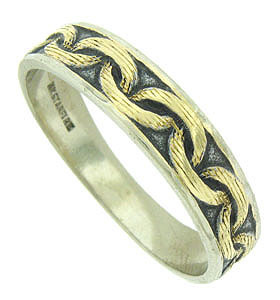 A darkened surface beneath the gold links brings added depth to this handsome wedding ring. The ring measures 5.82 mm in width. Size 12 1/4. We can re-size.